Collins Booksellers - 11 Cards: Quick Start Guide by Bruce Campbell, 9780991753307. Buy this book online. While this schedule was enacted to ensure treatment quality, its relentlessness often seems instead to interrupt the treatment of clients and lessen the effectiveness of the treatment professional. But it doesn’t have to be that way. 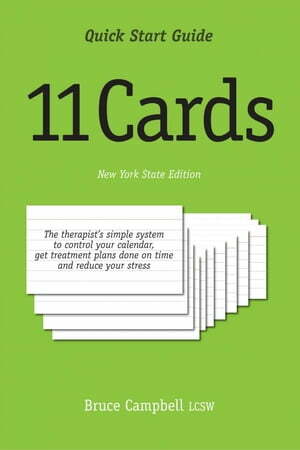 The 11 Cards system is a simple method developed by a therapist to control the calendar and help you get your work done, manage your time and reduce your stress. I needed and wanted something simple that didn’t require elaborate spreadsheets or ticklers to manage, something so simple that it could be managed with a just a few minutes of work every week. I determined that the information I needed could be handled with 11 index cards. As a time management and productivity tool, the primary goal of the 11 Cards system is to find you more time for your clients and provide more certainty of regulatory compliance.